Life of a Catholic Librarian: Tea Time with Tiffany #35 - Assorted Lenten & fitness updates, plus "You want to write your paper on *what now*?!" 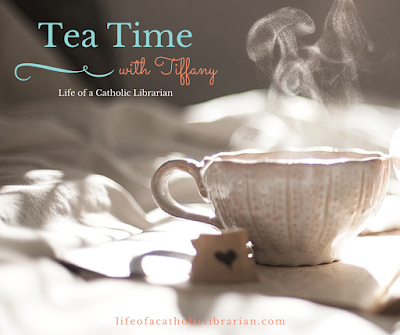 Tea Time with Tiffany #35 - Assorted Lenten & fitness updates, plus "You want to write your paper on *what now*?!" Zumba playlists. I've been Googling lists like this one and adding the songs I remember from my class or others that strike my fancy to a new playlist on my iPod. LOVE. Lenten reading list via the Catholic Book Club - Life From Our Land: The Search for a Simpler Life in a Complex World, by Marcus Grodi, and When You Suffer: Biblical Keys for Hope and Understanding, by Jeff Cavins. I covet your comments, and as ever, I'm looking forward to talking to you again next week! I started the Second Greatest Story Ever Told by Fr. Michael Gaitley yesterday, and plan to use that as my spiritual reading during Lent. I want to add nightly journaling and eihter Morning Prayer or Night Prayer each day. I'm joining Hallie Lord in giving up a fear (http://hallielord.com/2016/02/10/40-days-to-fearlessness-a-journey-to-freedom/), and also joined the Lenten Mercy Challenge that you talked about in the episode. During Lent since 2013 I have given up secular books and so I read nothing but Catholic or Christian books. As of right now I am reading 'Aquinas at Prayer' by Fr. Paul Murray, OP. It is quite good and I love Fr. Paul's work. Maybe tomorrow I will look through my Catholic bookshelves (yes I have bookshelves dedicated to Catholicism) and any of them I have read (which a good many) I will make sure to comment again to give recommendations. I read too much! A weird thing I noticed while reading my Lenten book (God For Us: Rediscovering the Meaning of Lent and Easter): I really like reading scripture online! The book has suggested scripture passages for each day, and I've been looking them up on my phone to read while I have the book in my lap. This is terrible but I've never really liked any of the Bibles I've owned...several have had that tissue-thin paper and it bugs me. I get bored just looking at it! So the devotional + scripture online is working well for me so far. Anne, that's excellent, what a good idea!